In XML schemas, you can use a regular expression with the "pattern" facet to restrict the values a type allows to certain regex matches. For this, the XML Schema standard defines its own regular expression flavor. This flavor is limited compared to the regex syntax used by .NET or Java. It is optimized for its intended use (input validation) and for easy implementation in custom hardware and software that needs to process XML at high speeds. If you copied a regex written for another programming language, simply paste it into RegexBuddy, select the original language, and then convert the regex to the XML Schema regex flavor. 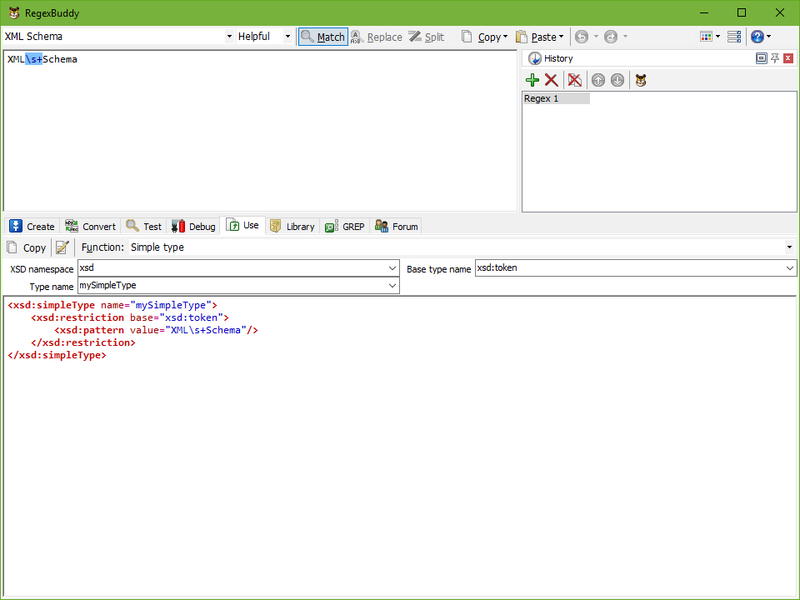 If you created a new regular expression, test and debug it in RegexBuddy before using it in your XML schemas. Test each regex in RegexBuddy's safe sandbox without risking precious data. Quickly apply the regex to a wide variety of input and sample data, without having to produce that input through your XML tools. Finally, let RegexBuddy generate an XML snippet that you can copy and paste directly into whichever XML editor you use. Just choose what you want to use the regex for, and a fully functional code snippet is ready. You can change the names of types and attributes to suit your naming style or the current situation, which RegexBuddy automatically remembers. Don't worry about properly replacing ampersands and angle brackets with XML entities. Just tell RegexBuddy what you want to do, and you will get the proper XML code straight away. "I'm a software developer using BizTalk to process XML files. Recently we have had a project where over 250'000 XMLs had to be parsed before processing. RegexBuddy not only helped simplify the process, but was able to help me to optimize my statements to clean up the data so that we could process them effectively and correctly. "Since using RegexBuddy, my Regular Expression skills have helped my career by becoming a knowledge source for regular expressions for within my office, and I get to still use it in my everyday work for complex find and replace expressions."